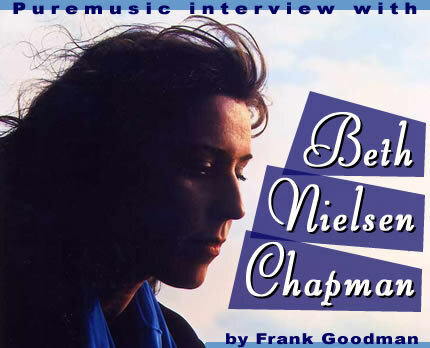 On anybody's short list of Nashville's greatest singer songwriters, one finds Beth Nielsen Chapman. She is distinguished not only by the impressive list of cuts she's had (and the legends who have cut them) but further by the places in the Top 20 of various charts that her songs have reached. Just to name one, "This Kiss" was a worldwide hit for Faith Hill and the ASCAP Song of the Year in 1999. Ironically, she is perhaps nearly as well known for her trials as for her triumphs. When her husband Ernest died of cancer in 1994, Beth released Sand and Water. Sir Elton John talked at length about this moving record and the title song in an appearance on the Oprah show, and then he sang it (instead of his classic "Candle in the Wind") in a service after the death of Princess Diana. Not many years later, Beth was diagnosed with breast cancer and went into a several year chemo battle, which she appears to have won. Typically, she was very forthcoming and outspoken about her process and kept turning her life into art. BNC is also a hit artist with several Top Tens in the 1990s, and her popularity includes Asia and Europe, where she enjoys large followings. We found her to be a very savvy music business person, and in our conversation to come, she shares some wisdom on crossing over from major label deals to being a successful indie artist. After a year or two out (and several successful singles) in the UK, her new record Look will be appearing on Nashville's Compass Records label in June. We'll plan to do a review of it at that time, to remind you to pick it up. This is her sixth US release, and previous ones can be purchased at her website. Check out her bio there for detailed information on the many artists that have cut BNC tunes, it's pretty amazing. Take note, songwriters. We discuss in the interview an upcoming workshop that Beth is giving with Julie Portman and Paul Reisler. Her wonderful twist on the theme is that they're doing it at the Vanderbilt Dyer Observatory. Another twist is that it will feature a "Drive-By Hit Songwriter" section where some famous friends will drop in with anecdotes and tips and even play songs and illustrate from whence they came. You can also find out more about the Songwriting and Creativity Stargaze at the artist's website.